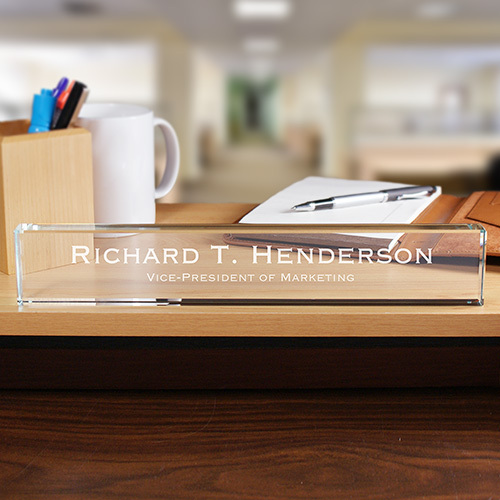 Celebrate a new promotion or finding a new job with a Personalized Executive Desk Nameplate. A unique, Personalized Gift which looks great on any desk. Give this Engraved Desk Nameplate to your Dad for Father's Day or Mom for Mother's Day as a way to show your appreciation for the work they do every day. Quality of the product exceeded my expectations. Turned out better than expected. It was beautiful and my husband loved it. It's beautiful! I plan to purchase two more as gifts for coworkers. An Engraved Keepsake is the perfect personalized gift idea to give to that special person in your life. Your sweetheart will love this gift & cherish it for years to come. Our Engraved keepsakes make unique gifts for a bridal wedding shower, starting a new job, graduating from school or celebrating a new beginning. When your anniversary comes along and you need that special Personalized Anniversary Gift, start here with our Engraved Keepsakes. A Personalized Keepsake is also great engraved gift ideas for Valentine's Day, Sweetest Day, Weddings, Anniversaries or any Romantic Gift Giving Occasion. Get all your Personalized Keepsake Gifts at GiftsForYouNow.com.